This page last revised July 9, 2015. 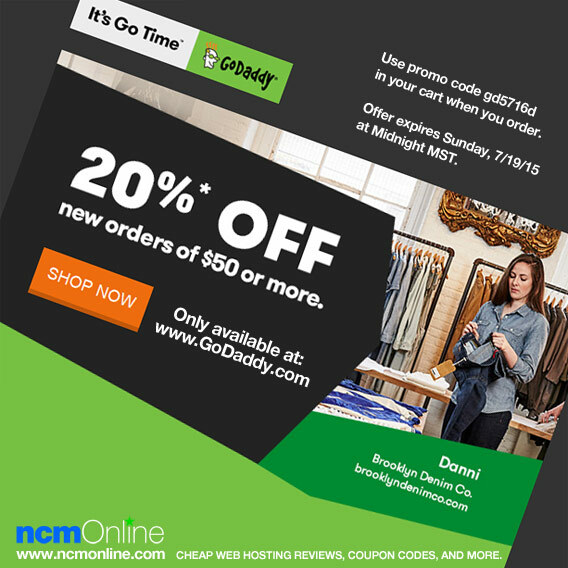 Enjoy 20% off the entire GoDaddy catalog of products and services on new purchases of $50.00 or more. Use promo code gd5716d in your cart when you order. Expires Sunday, July 19, 2015 at midnight MST. Not applicable to ICANN fees, taxes, transfers, premium domains, premium templates, Professional Design Service fees (including Web Design, eCommerce Design, and Logo Design), gift cards or Trademark Holders/Priority Pre-registration or pre-registration fees. Offer good towards new product purchases only and cannot be used on product renewals. Cannot be used in conjunction with any other offer, sale, discount or promotion. After the initial purchase term, discounted products will renew at the then-current renewal list price. Offer expires Sunday, July 19, 2015 at midnight (Mountain Time).